In 1997, I was on the edge of bankruptcy, choking on debt, and afraid for my family's future. When I first saw this post in April 2014, about me entering the list of the top 150 Network Marketing earners in the world, I could hardly believe the contrast. I was a partner in a clothing manufacturing company, also known as the "rag trade". In 1997 a client canceled a multi million dollar contract without warning and we burned through cash like a wildfire trying to save the company. Knowing that a J.O.B. was never going to get me out of debt, having no money to start a new company, I turned to a young start up Network Marketing company and within 10 months I was debt free. Network Marketing Saved My Life! I was broke and desperate. My first check in 1997 was for $6 and change. It wasn't long before the checks turned to 4 figures. My first check for over $5k gave me the belief that it could get to $10k. When it got to $10k I felt like Superman, and when it climbed into 30 and 40k per month. I was ready to think without limits. And now, at over 100k per month and growing, we live a life that is debt free, a life full of possibilities, and a desire to help other families claim their dreams. I was not some "heavy hitter", back then I was simply desperate, scared and unwilling to give up on my dreams for my family. I applied simple systems to grow my business and I mentored dozens of people to utilize these systems. As their incomes grew my income grew exponentially. It's not magic. But it is strategy. And I teach this strategy to my associates all over the world. Today I have the largest organization in the company with the highest earners, highest ranks, in over 150 countries and growing. This is not by chance but by design. Do you have what it takes to earn a 6 Figure Annual Income? Or a 6 Figure monthly income? I work with a company that is a category creator. 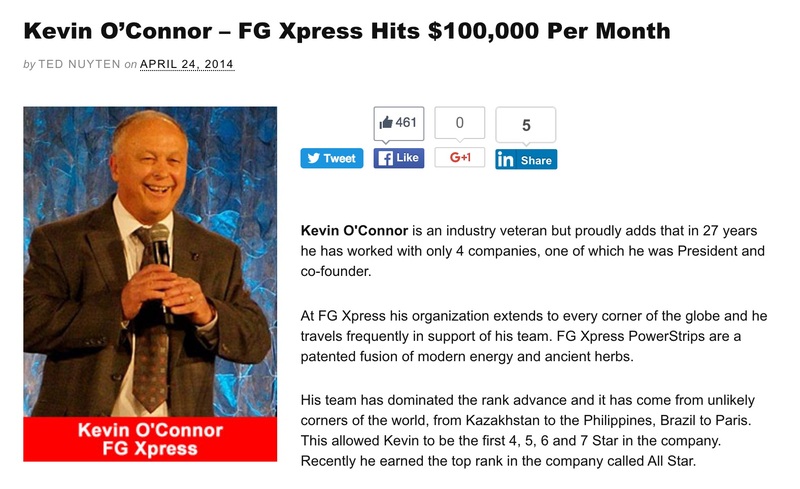 In fact the FG Xpress business model is so unique, no one has ever done it before. Watch this 4 minute video. If it catches your attention and you want to know more then please fill out the contact form. Please let me know if you have either Network Marketing or entrepreneurial experience. The most important criteria for me; are you teachable and do you have a burning desire to be financially free? If not, please, let's not waste each others time.